Compared to many hyaluronic acid fillers available on the market, Belotero® molecules are lightweight and thin. Because of proprietary technology – Cohesive Polydensified Matrix – Belotero has high elasticity. What this means to you is that the solution distributes evenly into the skin, smoothing out your fine lines and wrinkles and giving a fresh, hydrated look to your appearance. Sometimes other hyaluronic acid fillers can raise the dermis, clumping under the skin. Belotero, on the other hand, distributes seamlessly across a wider area. During aging, our bodies’ production of structural support such as hyaluronic acid (HA) begins to disappear, resulting in fine wrinkles and lines. With Belotero, you can walk away with noticeable, instant results. Belotero is a unique dermal filler approved by the FDA that seamlessly integrates with your skin and adapts to your facial contours, therefore plumps and adds volume to your face. Find out how Belotero softens and smoothes lines and wrinkles so discreetly like no other filler. Belotereo is made from hyaluronic acid. This acid is found naturally within your skin, but it diminishes as you age. Because hyaluronic acid is found naturally within your skin, it is safe and effective at adding volume and smoothing out the skin’s surface. Once injected, Belotero instantly binds with the water within your dermis and helps fill in creases, lines, and wrinkles. The changes to your face are immediately apparent. 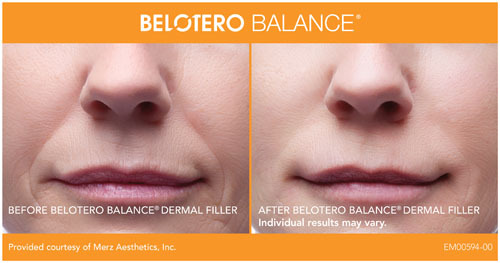 Belotero is a filler that treats deep creases just as effectively as it does small lines. As a result, it is completely effective in creases like the nasolabial folds, the lines that travel from the side of the nose to the edge of the mouth. It also works on finer lines like those you find above the lips. Finally, Belotero also proves beneficial in helping fill in the hollows that occur under the eyes in the area known as the tear troughs. WHY CHOOSE BELOTERO OVER OTHER HYALURONIC ACID FILLERS? While Belotero does contain hyaluronic acid, it is different. The main benefit is that the mixture used in Belotero is unique in that while some fillers create a puffy or lumpy look, Belotero can many times avoid this. In addition, some fillers create a bluish tinge because of the Tyndall effect in areas with thin skin, Belotero does not. Contact us for a free consultation to learn if BELOTERO is right for you!